Create excitement in collectible market and maximize licensing relationships. 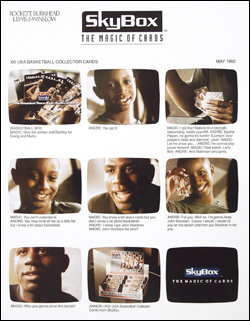 TV commercial featuring Magic Johnson and his son, Andre. Targeted correspondence with brokers, distributors and hobby stores. Integrated PR efforts, advertising and product development. Value in licensed property is "borrowed interest" and must match desired consumer target audience to help a product or product line.